If You're Buyin' Or Listin' Be Sure To Use Kristin!" My first motorcycle tune up. I spent 8 hours today working side by side with a fellow Airhead and BMW aficionado Sgt.Colt, who very generously offered his time and expertise to teach me some basics of motorcycle maintenance on my 1975 BMW R-75/6. 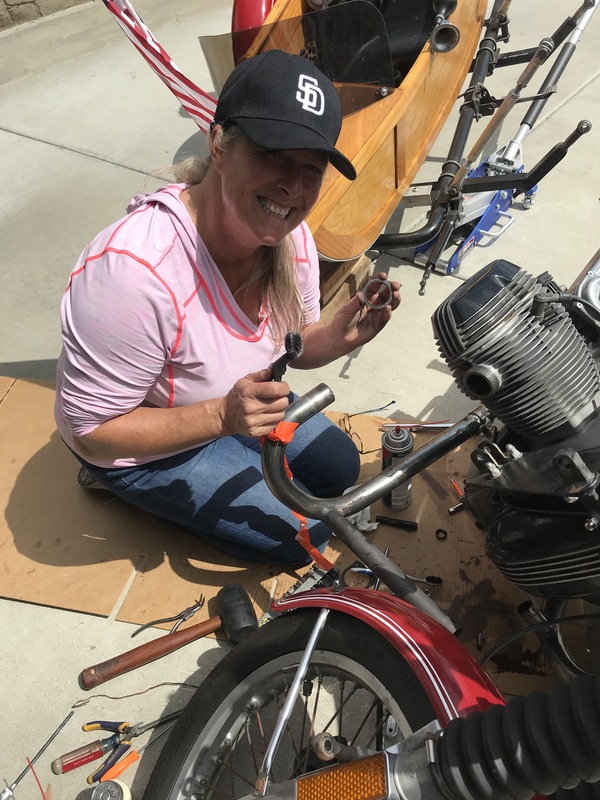 Now you’d think “checking tire pressure, checking the oil on the dip stick, changing the spark plugs, tightening various screws and clamps” would be in order..we absolutely did all of the above, but I had no idea we’d be delving into my motorcycle engine like we did. I did have new tires put on and we checked my brake pads which needs to be changed, but that’s another day (along with a new throttle cable). Colt had asked me to order a few parts from Max BMW who specializes in various year and model BMW’s so I ordered an oil filter, a few spark plugs and a couple head gaskets. We started with the oil first. Seeing how we wouldn’t be able to access the area to put in the new filter because of the sidecar, we had to remove the sidecar. I’ve never taken it off the bike before. 5 large bolts and screws were removed but before the last screw was out, the sidecar was heavier than I realized and bonk, onto my forearm it went, goose egg from my first major tune up. Now we needed to put on the new cylinder head gaskets. 3 screws needed to come out before the cover would pop off. Once the screws were out, it took some pressure to remove the cover. Once on the inside, we adjusted the carburetors. Colt had just the right tools and guidance to make sure intake and exhaust numbers were exact. At this point I ordered some sandwiches because we had started at 10:00 a.m. and by this time it was 1:00. It doesn’t seem like we’d accomplished a lot but Colt was teaching me everything I needed to know along the way so that takes time and I really appreciated it. The bike needs Castrol T4 20-50 oil so I picked up 3 quarts at O’Reilly before I showed up (along with a 12 pack of Modelo and a 12 pack of Sierra Nevada Pale Ale as a gift for his kindness in teaching me this stuff and getting my bike tuned up). I filled the oil and checked the dip stick. Good to go. New spark plugs were put in then it was time to reattach the sidecar and take it out and ride for 10 miles to get the engine hot and return to have the carbs adjusted. It didn’t take too long to put the sidecar back on. The bike ran better with the new oil and filter. When I returned, Colt connected the device that balances the carbs. I had to lay on my back and quarter turn and 1/2 turn the idle with a screwdriver until it was perfect (a bug did crawl down my back, but it wasn’t half as bad as the bug that went down my throat while I was riding my bicycle the other day). 2 beers, a sandwich, lots of lessons on how to maintain and tune up your motorcycle properly and 8 hours later, we were done. Thanks again to my mentor Colt for helping a girl out. It was a great day.